Sometimes you just need to make a fast prototype and you don’t want to mess with back end, authentication, authorization and all of that. 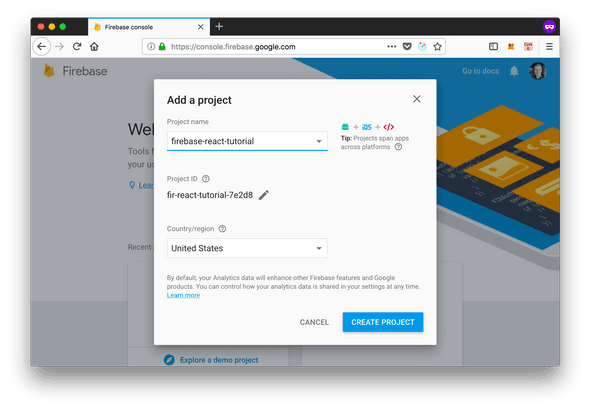 Here is where Google’s firebase can help you. In this tutorial I’ll show you how to connect your react app with Firebase authentication module. Super simple app. Just 3 screens: Sign up, Log in and Home screen. 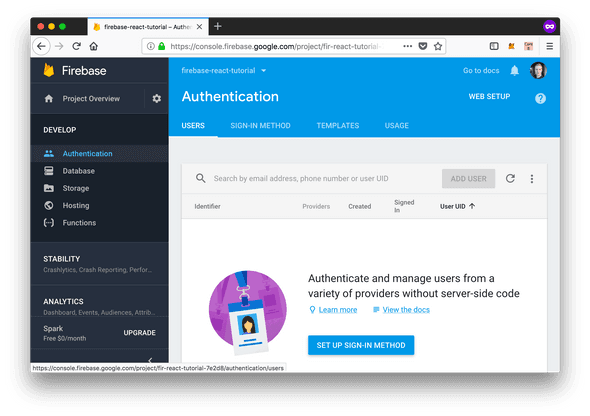 We’ll use Firebase Authentication module to handle login/sign up and React router to manage routing. Make sure to read till the end, I’ll post a link to Github repo with example code there. First go to firebase console and create new app. Click Authentication and then SET UP SIGN-IN METHOD. 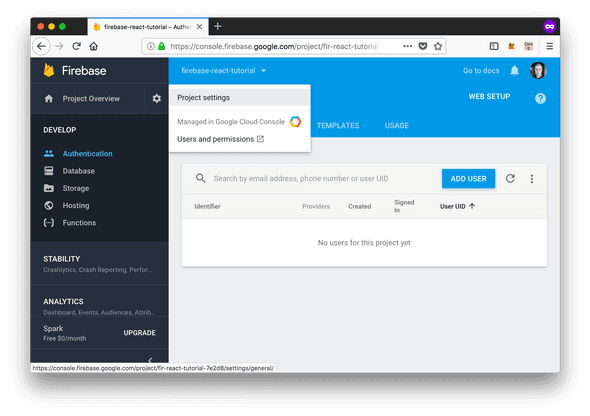 And select Add firebase to your web app. Copy your credentials from there and save them to .env file in your project’s root. create-react-app webpack config automatically loads environment variables that start with REACT_APP, so we can reference them. We will set up the application using create-react-app. I assume that you have modern version of npm so I’m going to use npx to run the script. Also remove src/index.css, src/App.css and src/App.test.js files. We won’t need them now. Run the application. You should have all routes available. This is simple presentational component. We get the onSubmit handler as one of the props and attach it to our form. We defined email and password fields and added Sign Up button. This component will handle our sign up logic. Let’s look at our handleSignUp function. It’s defined as an anonymous arrow function. I did it here to avoid using bind(this). In this example I really need class level this because of the history object I get from props by using withRouter wrapper. Otherwize I’d better define it as a regular function. So in this function I preventDefault to avoid reloading page, get password and email from form elements and try to create new user on Firebase using createUserWithEmailAndPassword function. Ok, great now we can sign up, and log in, but unfortunately it doesn’t make much sense, because home page is available even for the non-authorized user. Let’s fix it. Basically this component will conditionally render either passed Component or <Redirect/> block, depending on passed authenticated prop. We used authenticated field of our state, but it doesn’t exist yet. Let’s fix it. So now we’ll render Loading... until we get data from Firebase and update our state. Then we render routing and PrivateRoute redirects us to Log In page if we are not signed up. Also with this knowledge you can add authentication to wallet app from the React Ethereum Tutorial and build your own ICO platform! So go crazy, build stuff and see you next time.